Finger injuries are very common in basketball players and range from minor sprains to fractures and dislocations that may require surgery. The key to quick recovery rests on early evaluation (within the first 24 to 48 hours after the injury occurs), correct diagnosis, and appropriate treatment along with physical therapy and patient compliance. Since the severity of symptoms does not necessarily correlate with the severity of the finger injury, it is important, especially for serious basketball players, to be evaluated by an orthopedic hand specialist. Taping an injured finger and postponing an evaluation by a hand specialist not only delays the appropriate treatment but often results in a poor outcome, which can lead to finger surgery that would have otherwise been unnecessary. Mallet Finger - Mallet finger is one of the most common injures in basketball players. It occurs when the ball strikes the end of an extended finger causing forceful bending of the last finger joint (DIP joint) and rupture or tearing of the extensor tendon, which is attached to the finger bone. Injured finger becomes painful and swollen at the DIP joint and the tip of the finger feels and looks stuck in a bent position. If not treated in a timely fashion, the injury can lead to permanent deformity and discomfort. Jammed Finger - When a basketball hits the finger "head on" while the finger is fully extended, collateral finger ligaments can tear or rupture, usually at the middle knuckle joint of a finger (PIP joint). In addition, the collateral ligament can tear at its attachment at the volar plate (thick ligament on the palm side of the joint) and middle phalanx. These injuries are frequently accompanied by avulsion fractures, which occur when a piece of bone is torn away by a tendon or a ligament. It is important to evaluate the jammed finger quickly as the avulsion fractures indicate major ligament or tendon injury and can lead to significant long-term pain and stiffness if not treated appropriately. 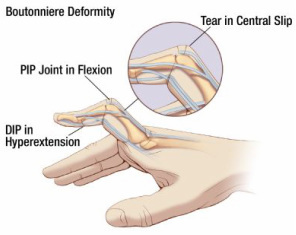 Volar Plate Injury - One of the most common injuries to the PIP joint occurs on the palm side of the finger joint to a thick ligament known as the volar plate (Figure 1). Any injury that causes hyperextension (backward bending) can result in a tear of the volar plate with or without an avulsion fracture. Figure 1. Volar plate injury. Central Slip Extensor Tendon Injury - Center slip extensor tendon injury is highly common injury in basketball players. It occurs when the PIP joint is forcibly flexed while actively extended. Another cause of the central slip tears is the volar (palm-side) dislocation of the PIP joint. In either case, if the injury is not treated in a timely fashion, the affected finger will develop a Boutonniere deformity. Figure 2. Central slip extensor tendon injury. The PIP joint and the MP joint (knuckle joint) dislocation - All dislocated joints need to be immediately evaluated to assess for tendon, ligament, and bone injury. Although the dislocated joint can often be reduced on the basketball court, any joint that cannot be reduced is considered an emergency. Finger fractures - Finger fractures in basketball players can range from simple, hairline fractures of the phalangeal shaft to complex DIP and PIP joint avulsion fractures involving ligaments and tendons. It is important to have the finger evaluated even after seemingly minor injury in order to avoid development of finger deformity and stiffness.